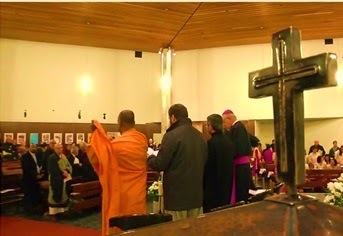 Buddhists, Jews and Muslims joined Christians to pray and reflect on Pope Francis’ message for the world day for peace 2015 titled “No longer slaves, but brothers and sisters” at an interreligious service, held at Saint Nicolas de Flüe Church in Geneva this past January 19th. A warm message from Mgr. Richard Gyhra (First Secretary of the Permanent Mission of the Holy See in Geneva) commenced the ceremony that welcomed the representatives of the distinct faiths and guests to reflect about the negative connotations that slavery denotes, as well as extending an invitation to promote and work towards peace. Invocations delivered in six languages called upon respect, solidarity, and fraternity across geographical and spiritual borders. The participants: Ven. Dr. Bhante Dhmmika Tawalama (Responsible Monk at Geneva’s International Buddhist Center), Mahdi Tonnerieux (Imam for the Cultural Islamic Foundation), Rabbi François Garaï (Liberal Jewish Community in Geneva), Mgr. Pierre Farine (Auxiliary Bishop of Lausanne, Geneva, Fribourg), H.E. Metropolitan Jeremy (of Switzerland), and Pastor Emmanuel Fuchs (President of the Protestant Church of Geneva); aligned spiritual and religious beliefs with the frame of an open and unbiased dialogue that resonated Pope Francis’ message across the minds of those present. A reception was held at the end of the service where all the attendants mingled and chatted without regard to religious denomination and in a true spirit of comity and goodwill. Events like this bring to light that peaceful coexistence is possible, especially when interreligious discussion and fraternity are present.